Every year this time it’s the same thing and I know now what to be alert for: sawfly larva! Interestingly enough, the two plants I examine couldn’t be more different–one is a dwarf mugo pine and the other is my roses. But the crafty little larva of these insects are on both plants and they conceal themselves nicely just the same. Each appears just around Memorial Day in my part of the country–New England–no matter what the weather. It’s been unseasonably warm and I spotted them perhaps 5 days before the holiday this year so they were about on target. This is one of the great things about gardening in the same place for any length of time–you really get to know your garden pests! These are the pine sawfly larva. 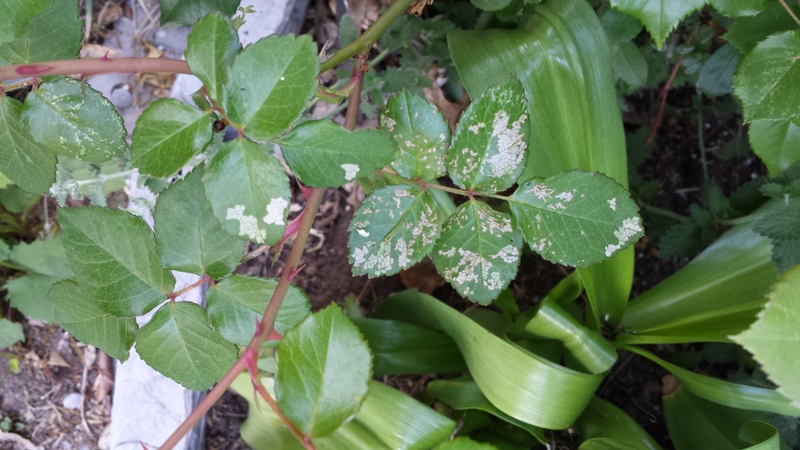 I use insecticidal soap with great success. Interestingly enough, I have a robin pair nesting very close by. I let these get quite large so that she could feast on them if she wanted but she shows no interest. It may be because they are not true caterpillars. Notice my previous sentence–these are not true caterpillars. Do not try to use bt on them. You can use Neem or do as I do and use insecticidal soap. (If you’re having trouble distinguishing them from the oak flowers that have fallen, the insects are the green and black striped things with the black heads. They will sort of rear up nicely at you, particularly as you spray them). I don’t spray my whole shrub–there’s no need. I just sort of hunt down the insects and spray those. Remember, these organic sprays have no residual effect so there’s no point in over-spraying. Then there’s this little guy. Talk about hard to see! Yes, there’s an insect in the photo. Most of the time, they are on the underside of the leaves, which makes spraying even more difficult. Look at the most damaged leaf in the photo. Find the mid-rib on the bottom-most petal. The little larva is lying right along that and is almost the identical color. 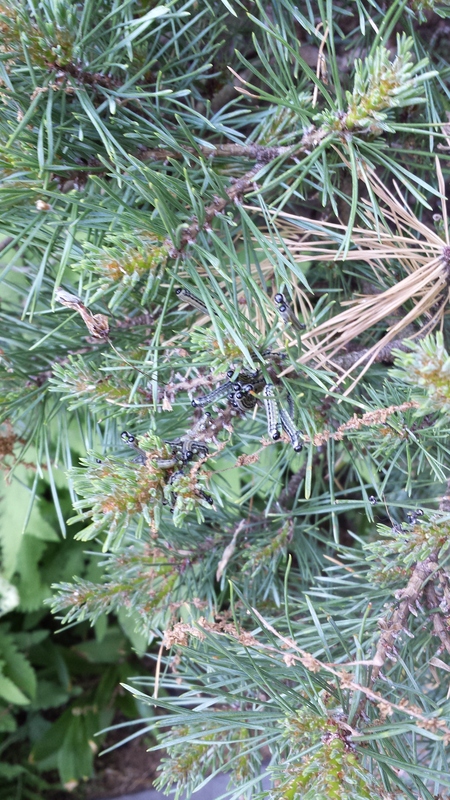 Another way to find them is to look for their “frass” (poop–small black specks). Or you can just notice the damage. Again I use insecticidal soap for this but neem will work. If your damage is just beginning, a strong spray from the hose should dislodge them, but be sure not to do that when the leaves will stay wet overnight. Once your plants have these insects, they seem to recur every year, so make a note of what time of year they seem to visit you (in warmer climates it can be multiple times, particularly with the rose sawfly larva!) and start watching for them! Getting them at the beginning, before they do much damage, is always far better than trying to feed your plant back into health! Next Article What’s Happening to My Hydrangea Leaves? I could tell you that it’s too dry here for us to be having much of a problem with mosquitoes but we’re just trading one set of problems for another, of course. All of those others that you mention–spittle bugs, leaf miners, tent caterpillars (which I think we’ve discussed (yuck)–are also fairly regular and seasonal. I get them, although to much less of a degree than you do, probably, being in a colder climate. So for me, I barely notice those where for you they could be major issues. I remember a friend from California telling me she absolutely had to use pesticides for aphids because they were such a huge problem. And I just puzzled over that. Then I realized she probably never got a cold enough spell to kill them off. So in that case, something that I view as a minor annoyance could really get way out of hand. I’m glad I don’t have to walk in her shoes–bug-wise!